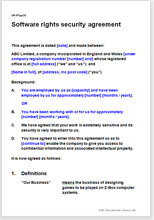 This agreement is a supplement to a contract of employment. Use it to protect intellectual property or other secrets in a high security environment. It will be signed by select staff employed on a special project or incorporated into the contract of employment for many staff working in a high security business. This is a high level intellectual property security agreement can be used in any business to protect the intellectual property of any sort. You might want special protection for: legal document templates; chemical formulae; photographs; software; or any other. This agreement makes absolutely clear that all work done is the property of the employer and provides that the employee will take whatever steps are necessary, as the employer requires, to make sure title to that IP is vested in the employer. Confidential information of all sorts is included in the protection. Use this agreement when you have a particularly sensitive project or area of your business or as a permanent addition to your standard contract of employment when all of your business activities require high level protection. We have a version of this contract which is not specific to employees. If you require to protect your IP from misuse by a contractor look at IP security agreement: contractor. Over 1,900 words of helpful drafting notes.